KALEIDOSCOPE is a good example of mid-60s hip brought to the screen, complete with sitar music on the soundtrack, every kind of for-the-hell-of-it camera angle in the catalog, choppy continuity and neat-looking stars trying by force of persona to cover what’s lacking in the script. 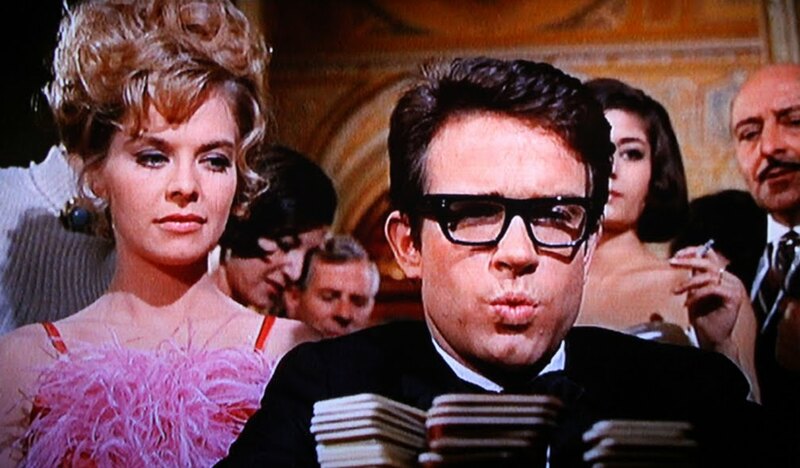 Warren Beatty plays a gambler with a rather ingenious method of stacking the deck in his favor at various European gaming spots. He’s eventually tripped up by mod-girl Susannah York and her Scotland Yard papa Clive Revill. They enlist Warren to capture a bad kind of crook (drug smuggler variety), and for 103 minutes the capering cavorts. The visual style of director Jack Smight ran even with the blandness of the screenplay back in 1966, but time has reduced the diversions of the technical tricks to mere hindrances, requiring a good deal of patience to sit through. Pass. Earning but $1,800,000 it fell into the hole of 101st place for the year. With Eric Porter, Murray Melvin, Jane Birkin and Anthony Dawson.